“B12 injections given here!” Doctor’s offices, chiropractic centers and other wellness-focused operations love to advertise B12. And why not? 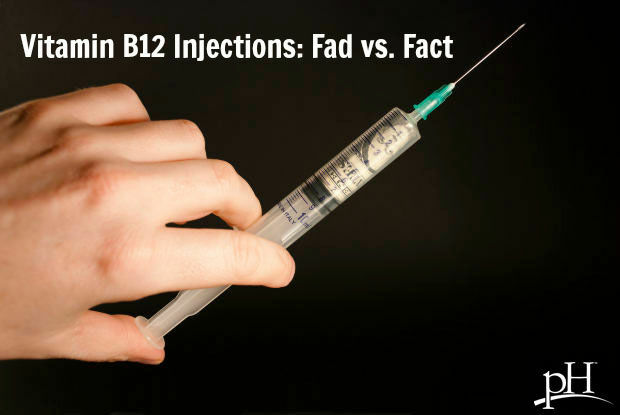 It’s profitable, and patients swear it gives them an “energy boost.” But while a “quick fix” for irritability or fatigue might be tempting, the notion of B12 as a cure-all, and a fast one at that, has a shaky foundation. The reason we don’t advocate B12 for all is that most people younger than 50 have perfectly fine levels of B12 already. Animal sources like meat and eggs are the primary sources of B12 in the U.S. A simple blood test can tell you your level — numbers between 500 and 1,000 pg/ml are desirable. At pH Labs, we help you find out what your body really needs through a personalized health assessment and advanced lab testing. This way, you’re not left to trial and error to find out what supplements to take or lifestyle adjustments to make. Our doctors will work with you to address any deficiencies in your body, including vitamin B12. Visit our website or call us at 855-PHLABS1 to schedule an appointment.